Pelvic and groin pain can be devastating, preventing mothers from caring for their babies, preventing athletes from advancing in sports, and can leave otherwise healthy people unable to get out of bed without horrible pain and embarrassing symptoms. Whether you have sustained a sports injury, experienced difficulties since giving birth, or suffered another traumatic incident, it is vitally important to understand the role joint instability and ligament laxity play in worsening or complicating your situation. Since 1993, Caring Medical has been the saving grace for many patients suffering from painful pelvic conditions. Our providers specialize in diagnosing patients, identifying the damaged tissue that needs to be targeted, and treating those areas with comprehensive Prolotherapy (including traditional dextrose, Platelet Rich Plasma, and Stem Cell Therapy). These treatments correct underlying instability around the pelvis and restore tissue strength and integrity. Using comprehensive injection protocols unique to our clinics, we regularly see pain alleviated and lives restored! Pelvic floor dysfunction, ischial tuberosity pain, hamstring syndrome, vaginal pain, groin injuries, and other pelvic pain conditions can be resolved with Comprehensive Prolotherapy. Navigate through the sections below for lots of pelvic and groin pain information or get help from our medical staff now. These are among many symptoms associated with pelvic floor dysfunction and other pelvic pain conditions. These symptoms can be signs of the following pelvic & groin pain conditions that we treat with Prolotherapy. Because of the soft tissue connections along the pelvis are dynamic, it is important to see a Prolotherapy specialist who can conduct a proper physical exam to determine the most comprehensive treatment plan. The arrows show the direction of body weight force as it is transferred between the pelvic ring, trunk, and femurs. 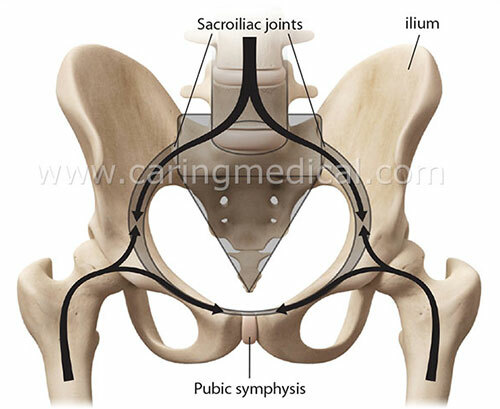 The keystone of the pelvic ring is the sacrum, which is wedged between the two ilia and secured bilaterally by the sacroiliac joints. 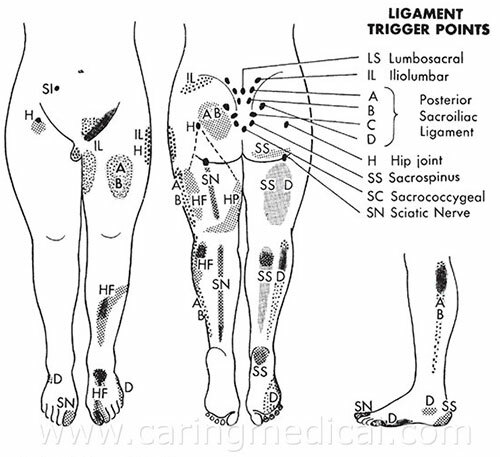 Adapted from: Magee D. Orthopedic Physical Assessment. 6th Edition. St. Louis, MO: Saunders; 2014. From Neumann DA. Kinesiology of the musculoskeletal system. Ed 2. St Louis, 2010. CV Mosby, p. 360. Redrawn after Kapandji IA. The physiology of joints. Vol 3. New York, 1974, Churchill Livingston. Chronic pain that does not respond to exercise, massage, or manipulation is most likely a ligament problem. Our providers see patients with pelvic and groin pain that have already been through round after round of physical therapy or other symptomatic but to no avail. When muscles contract against an unstable base, continuing to do muscle work will only prove frustrating. All the while, the stability continues to deteriorate. The symptoms return, and patients may even end up going through surgical procedures. You must address the unstable base/joint instability, including the pubic symphysis, along the pelvic floor and ischial tuberosity, and back to the sacroiliac joints and lumbar spine. Treatments in our clinics always start with a detailed history and discussion with the patient, and a thorough physical exam for joint instability and ligament and tendon laxity. From there, a comprehensive Regenerative Injection Treatment protocol can be determined, along with post-treatment instructions to help continue stabilizing and strengthening the area. As the pelvic base stabilizes, muscles can contract and body functions can occur without increased pain and pressure throughout the pelvic region. In cases of pain in groin, hamstring, rectal, vaginal, testicular, pelvic floor, and pubic symphysis areas, generally these pains can be reproduced when the ligaments around the pelvis are palpated. The most commonly affected areas are the ligaments around the sacrococcygeal junction, which includes the sacrococcygeal ligament, sacrotuberous, and sacrospinous ligaments. It's importance in stabilizing the pelvis with the sacroiliac ligaments and close association in the transmission of forces with the hamstring and gluteal muscle, is ofton overlooked. Patients with pain should have the sacroiliac joints palpated because sacroiliac ligament laxity can also refer pain to the groin. 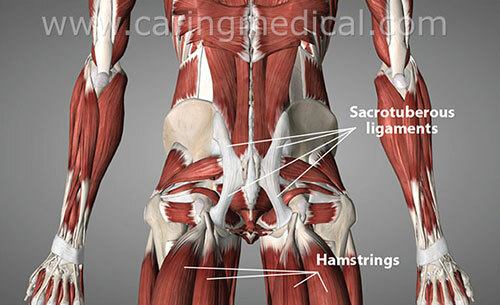 Another common cause of chronic groin, testicular, or vaginal pain is iliolumbar ligament weakness, because this ligament refers pain from the lower back to these areas. Buttock pain is the most common symptom of a sacroiliac problem. Adapted and modified from Slipman CW, et al. Sacroiliac joint pain referral zones. Arch Phys Med Rehabil. 2000;81:334-337. Used with permission from Hauser R, et al. Prolo Your Pain Away! Curing Chronic Pain with Prolotherapy, Third Edition. Beulah Land Press. 2007. Oak Park, IL. Prolotherapy treatments to the weakened ligaments help these areas heal and return to normal strength. Once the ligaments are strong again, typically taking around 3-6 treatments, the chronic pain abates. In cases of pelvic floor dysfunction, the additional symptoms such as difficulty with urination and bowel movements, as well as sexual dysfunction and abdominal pressure, can be eliminated as well. Athletes with chronic groin pain find that return to sports after Prolotherapy is generally quick and provides the desired long-term stability. 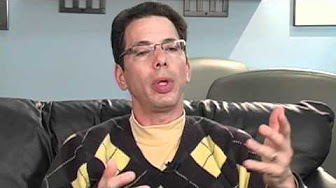 This is an ideal treatment for patients looking for long-term results. BP came to Caring Medical after suffering from pelvic floor pain for 14 months in her late twenties. Her pain had started immediately following childbirth and became progressively worse despite other treatments. 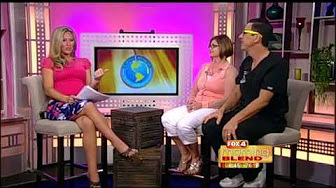 Brittney had tried massage, acupuncture, physical therapy, and dry needling without relief. She experienced constant pain and muscle spasms that would worsen to the point of being unable to carry her child. Among other symptoms, Brittney experienced constipation, pain with urination, and rectal prolapse. 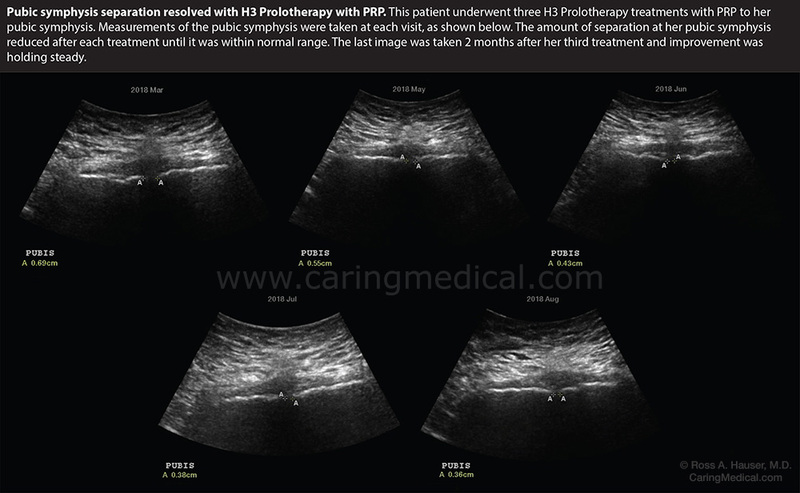 She was treated at Caring Medical with 3 sessions of Prolotherapy, which included Platelet Rich Plasma, to her entire pelvic floor. After 3 treatments, Brittney reported 100% pain relief and pelvic stability! She was able to return to full activity, including exercise! Pelvic floor treatments need to be comprehensive for maximum efficacy. This includes anteriorly at the pubic symphysis and posteriorly at the sacroiliac joints, and everything in between. While some women have the concentration of instability in the anterior or posterior, many women need the whole pelvic floor thoroughly treated. Seeking Comprehensive Prolotherapy sooner than later, especially if early physical therapy only gives temporary or minimal results, can save a lot of pain and heartache, especially for young mothers who want to care for their babies. For the past three years I have suffered from chronic pelvic and low back pain. My symptoms have included severe groin pain, inner leg/thigh pain, symmetrical hip pain, and intense low back pain. These symptoms grew over time to include upper back /collarbone pain and pelvic floor pain. There is no doubt that each of my symptoms was a chain reaction from the initial injury. However, with the pain so intense throughout my entire body, neither I nor my initial doctors, fully understood the problems going on within me. I have seen Dr. Hauser for treatment seven times, thus far. At my last appointment, I reported an overall 85-90% decrease in pain. Additionally, I have had recent MRI scans run, and there are no longer any bulging discs to report in my lower back—a true testament to the Prolotherapy treatments. Due to a history of groin pain, KB was treated for hip bursitis, but was eventually diagnosed with bilateral hip impingement and a right-sided labral tear per MRI. He sought Prolotherapy in lieu of arthroscopic exploratory surgery. KB described his pain as lateral as well as in the glut region. In addition, he noted a constant clunking sound in his hips, with increased pain upon movement. Bilateral hip instability was found upon physical exam. Three Platelet Rich Plasma Prolotherapy treatments were given, resulting in remarkable overall functional improvement, enabling KB to exercise without pain. People are often misdiagnosed with bursitis when the true cause of pain and impingement is due to underlying hip instability. Prolotherapy effectively stabilizes the hip joint and repairs the associated labral tears and impingement. How well do you understand the cause of your pelvic & groin pain? Pubic symphysis injury in Male Athletes does this ever heal? You deserve the best possible results from your pelvic & groin pain treatments. Let’s make this happen! Talk to our team about your case to find out if you are a good candidate.